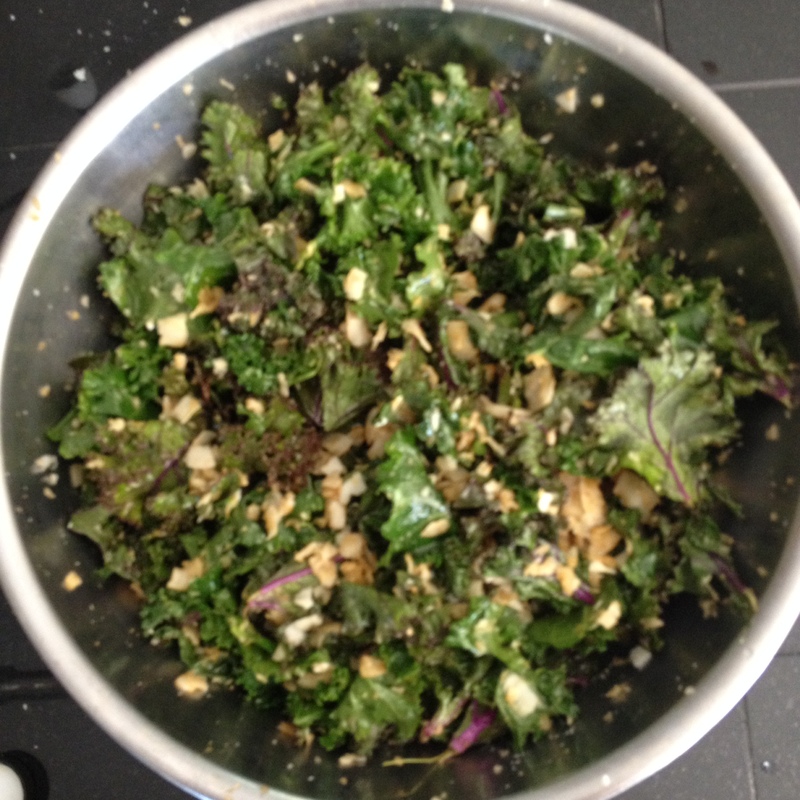 It’s no secret that I love kale. And coconut. And together, they make a crispy, savory and delicious snack. This comes together in minutes, and is a healthy alternative to toxin-laced store bought chips. Even with all of the kale chips emerging, I’ve never seen anything like this is available in a package. 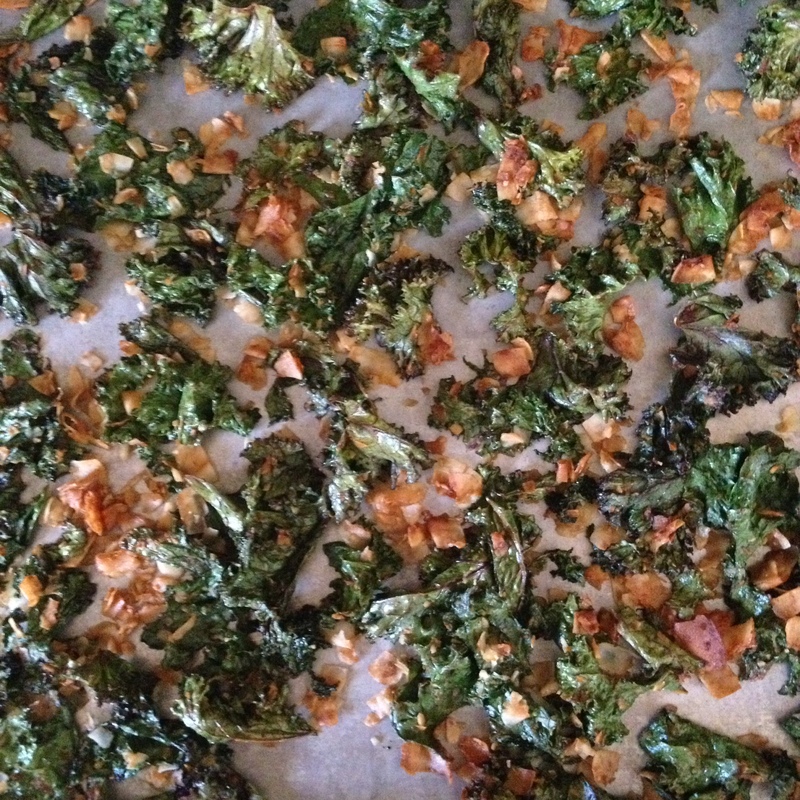 This was based on a salad recipe given to me from my friend Renee which included a grain I couldn’t eat, so I simplified it into kale chips. And I’ve been eating them ever since. 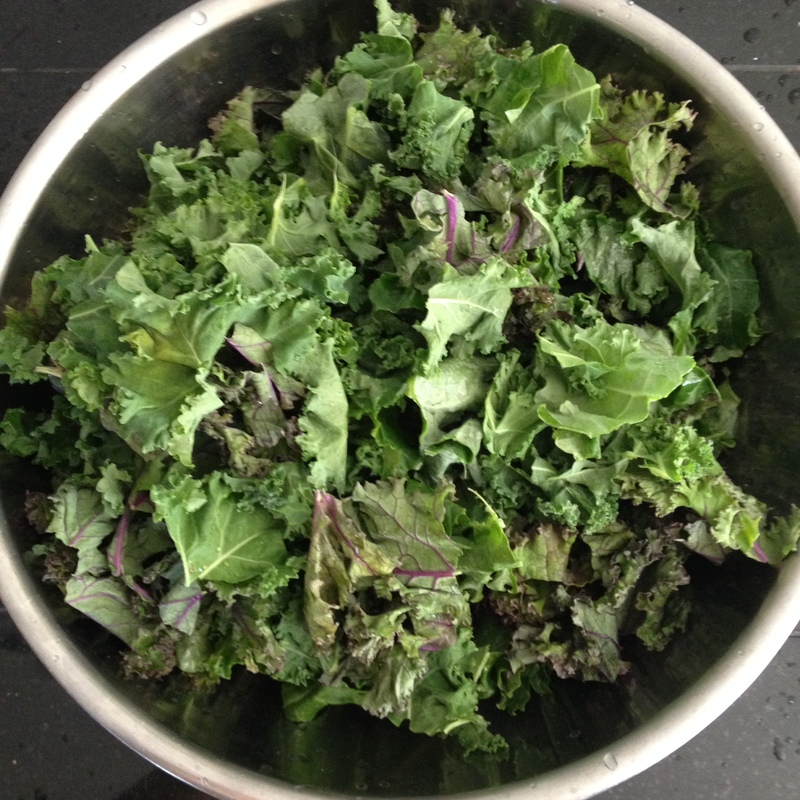 First, start with two bunches of kale, freshly washed and torn into large-bite-size pieces. They’ll shrink in the oven, so a little on the large size is just fine. Add in 2 cups of large flaked coconut. You could go as small as 1 1/2 cups, but I love coconut, so 2 works well for me. 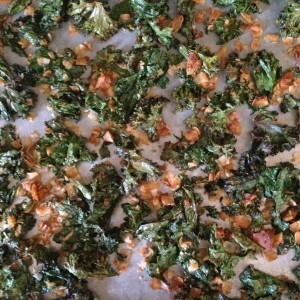 Using your hands, just mix the kale and coconut together, to distribute the flakes. In a separate bowl, combine 1/3 cup olive oil, 2 Tablespoons coconut aminos OR Tamari. Coconut Aminos are wonderful–a gluten-free and soy-free soy sauce. Tamari is what I had on hand today, which is a gluten-free soy sauce. 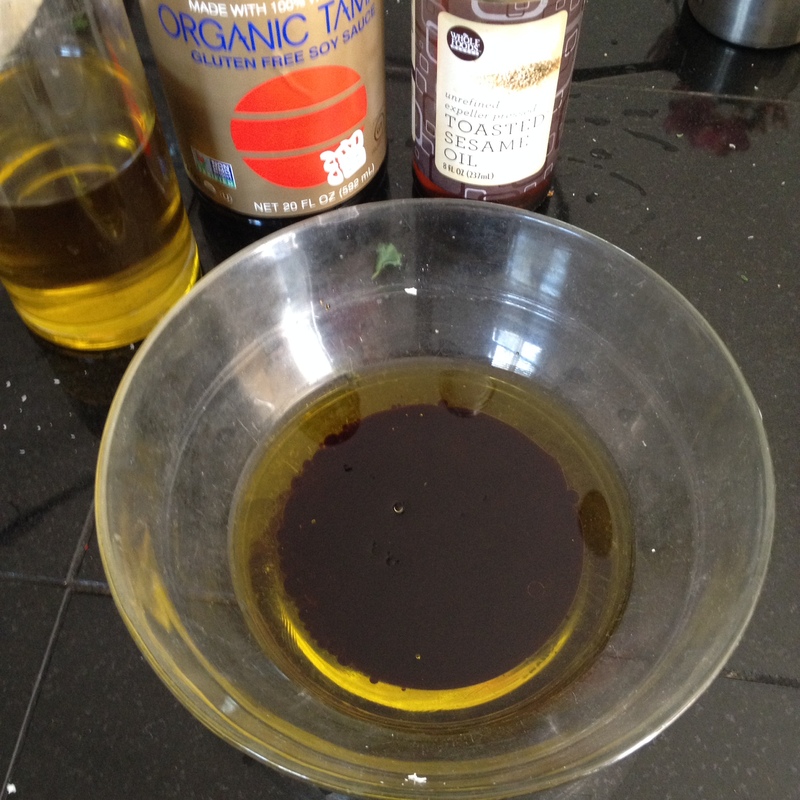 Add 1-2 teaspoons Toasted Sesame Oil, and whisk together with a fork. 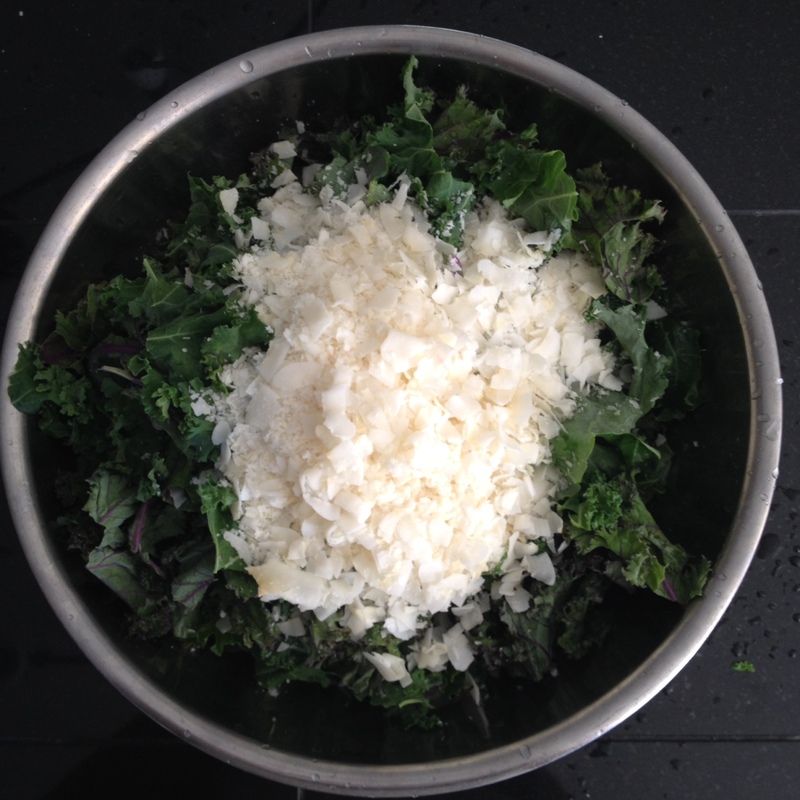 Add the oils to the kale and coconut, and massage with your hands to distribute evenly. You may need to add just a touch more oil, but if you really work it through, the 1/3 cup is generally enough. Place on your ungreased baking sheets. This was enough to fill two large sheets in my kitchen. Bake at 325 degrees (remember, olive oil goes rancid at higher heats), check after about 12 minutes. Since every oven is different cooking times are going to vary. When they start to get dry and slightly brown on the edges, they’re done. 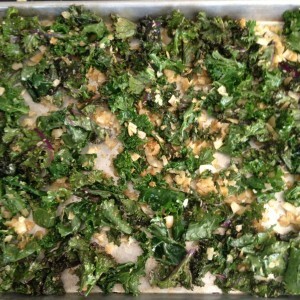 Occasionally I’ll remove the kale, leaving the coconut on the pan and bake for a couple more minutes. It depends on how patient I am. The pan on the top rack gets done ahead of the bottom tray, so I’ll also move it up when I take the first one out of the oven. 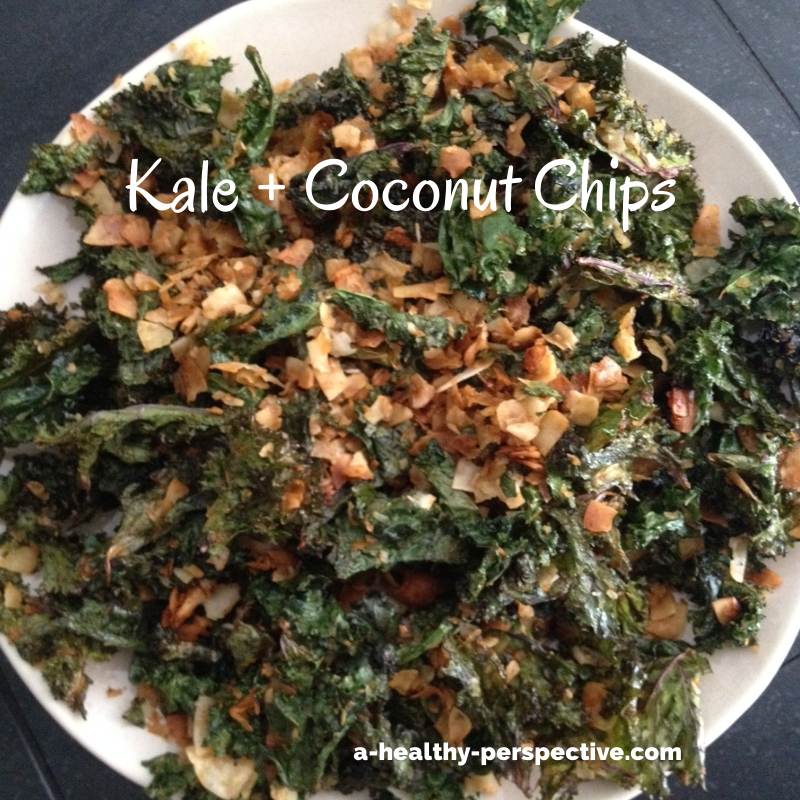 Massage Kale and Coconut Flakes Together. Whisk together remaining ingredients, and massage into kale. Distribute evenly over 2 large cookie sheets. Bake at 325 for 15-20 minutes, checking after about 12 minutes. Enjoy! This is a great snack for school, parties, or just to have on hand. 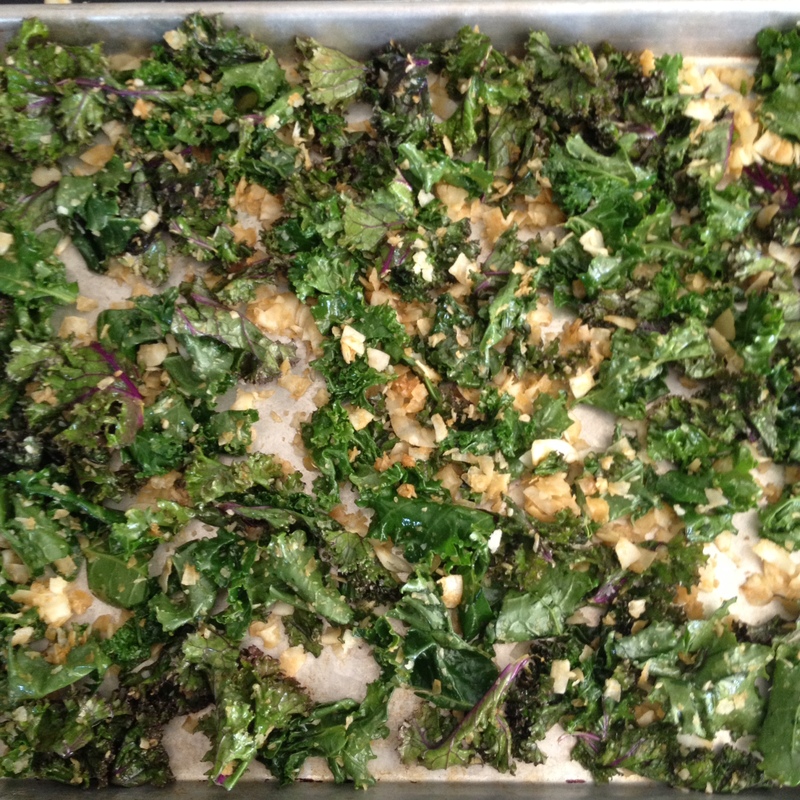 It’s always a hit, even with the non-kale eaters. They don’t last a single day in our house, so even though it seems like a lot at first, I promise they won’t last. Note: I have noticed that the chips will soften if you put them in a sealed container. Not so appetizing. One tip is to save a few of those non-edible packets that keep out moisture (from other kale chips or protein powders, etc.) and throw one into your container. Alternately, don’t seal up the storage container completely to allow for circulation. That’s if they last long enough to be packaged. 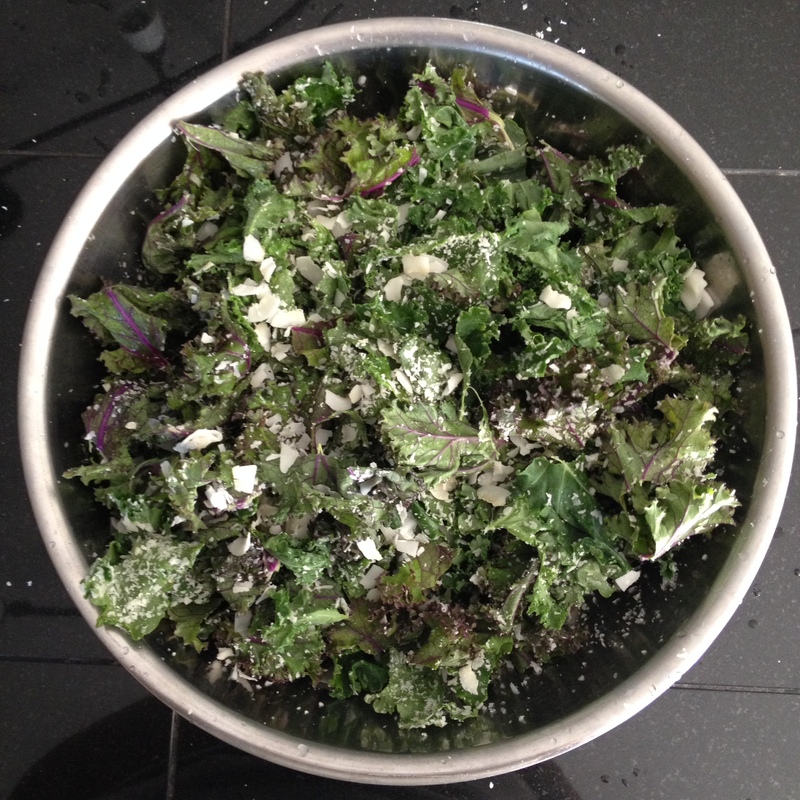 I’m often guilty of eating the “salad” out of the bowl before they even make it to the oven.